In Rest Area, Clay McLeod Chapman offered a view into the lives of Southern Gothic monstrosities. Now, the 40 tales of Nothing Untoward delve into the depraved minds of those madmen and women who drift along the periphery of humankind. Sometimes darkly humorous, sometimes strangely heartbreaking, these stories explore the domestic horrors of the everyday, finding terror within our own households. Haunting and hilarious, these sharply tuned diatribes are more than simple horror stories in the traditional sense. These offbeat psychological portraits are presented from the perspectives of the very monsters themselves. The heroes of these tales are murderers, loners, and drifters. Spanning over 20 years of the rigorous storytelling session "The Pumpkin Pie Show " the tales collected here are to be read out loud - or to yourself, if you're brave enough. The oral tradition is alive and well with these stories, captured on the page for you to share around the campfire, or flip through in bed late at night. These are ghost stories for people who don't believe in ghosts, haunted by their own crumbling minds and wounded hearts. 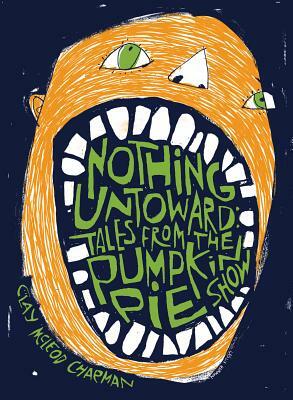 A perfect mixture of tongue-and-cheek gallows humor, psychological terror, and character-based storytelling, Nothing Untoward: Stories from "The Pumpkin Pie Show" focuses on the darker side of domesticity and won't let go.